Jazz Queensland Incorporated is proud to announce its 30th anniversary as Queensland’s peak Jazz service and presenter organisation. 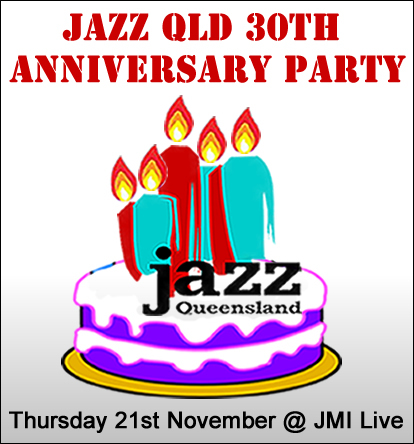 Jazz Queensland will be holding a special 30th anniversary party at the Jazz Music Institute (JMI) on Thursday 21st November from 6.30pm till late. Jazz Queensland president Lynette Irwin is encouraging all to attend this very special fundraising event, which will feature performances by some of Queensland’s most accomplished Jazz artists including; Trichotomy with Sean Foran, John Parker and Sam Vincent, also Paula and Dan Quigley’s new ‘Boplore’ group, and a unique vocal and guitar duo featuring multi award winning Kristin Berardi and the amazing Toby Wren. Then a jam session will follow from 10pm till late, so remember to bring your instrument! Jazz Queensland is a peak, non-profit incorporated association, originally the Jazz Co-ordination Program of Queensland est. 1983 and officially became an association in 1996 which continues to develop into one of Australia’s leading, key arts presenter and service organisations, curating our vast community of artists, audiences, venues, businesses, promoters, media and educators into a sustainable and productive Jazz sector. JQ is committed to building a sustainable Jazz and Improvised Music sector in Queensland. Key to this is raising the public profile of our innovative cultural product and establishing regular employment opportunities for Jazz and Improvising Artists in Queensland. Their events provide artists with a unique forum for innovation which encourages the development of new work and directly provides performance opportunities for established and emerging artist to present their high quality original material, while exposing their music to new audiences. Artistic impacts are evident in the positive effects experienced by participating artists, who continue to develop and achieve locally, interstate and internationally. Jazz Queensland’s annual program of events currently includes the Brisbane International Jazz Festival, (formerly Valley Jazz Festival) the Monthly Turbine Jazz series, the Monthly Queen Street Mall Jazz weekends, the annual Jazz On Sunday series at the Brisbane Festival Spiegeltent and numerous other Jazz events and initiatives with key organisations including the Brisbane Festival, Valley Fiesta, Brisbane Powerhouse the Judith Wright Centre of Performing Arts, Brisbane Jazz Club, Jazz Music Institute, Brisbane City Council, and Brisbane Marketing, Jazz Scene, Jazz Australia and many more. Jazz Queensland also provide a range of services and artists self-promotional tools including Queensland’s most comprehensive Jazz Gig Guide, Jazz Qld news, performance opportunity register, composer commissions, CD review opportunities, advertising, website and Facebook integration. For the fundraiser, tickets are $25 and will include these 3 great acts, a light BBQ dinner, and a ticket in the special ‘Jazz Raffle’. Drinks will also be available at the new JMI Live licenced bar! So come along and help us celebrate an impressive 30 years of growth, sustainability and creative music in Queensland’s vibrant Jazz sector!